Legendary supermodel and savvy businesswoman, Elle Macpherson has been rocking a men’s Rolex for decades – long before it was considered cool for women to do so. Yes, men’s Rolex watches are a favorite among female celebrities and trendy fashionistas today – particularly the Everose gold Daytona — however, this is a relatively recent trend. Elle however, has been doing it her way for a long time. Whether frolicking on the beach, posing for fashion magazines, or attending high profile events, the native Australian is rarely without a yellow gold Rolex watch strapped to her wrist. 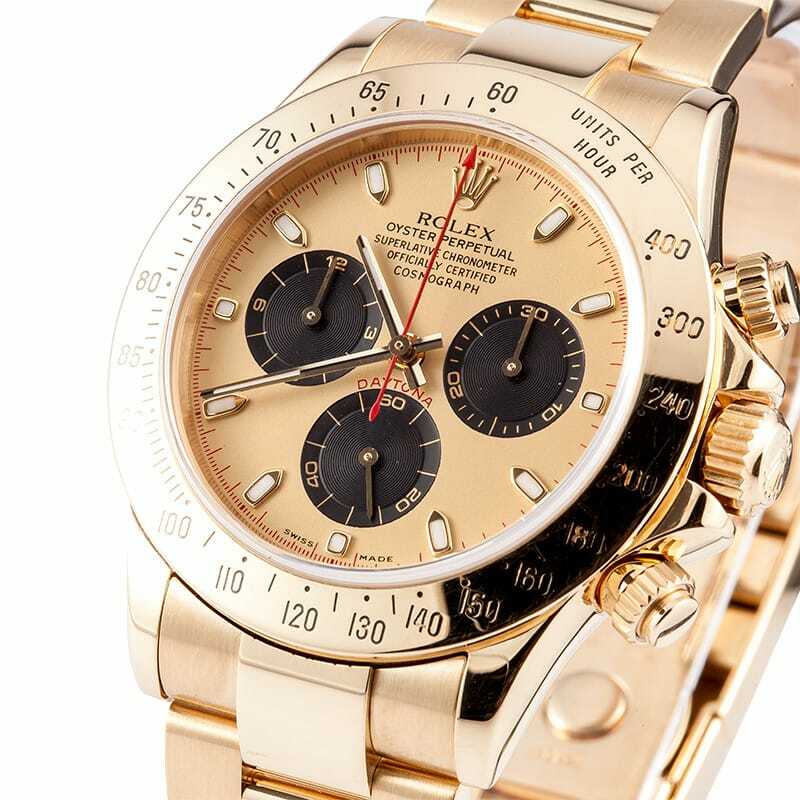 Judging from her photos, one of Elle Macpherson’s favorite Rolex watches is a 18k yellow gold Daytona with a white dial. The ultimate luxury chronograph, the Daytona is iconic and sporty, and at 40mm, it’s a generous watch for a ladies’ wrist. The 18k yellow gold Oyster case with matching yellow gold Oyster bracelet wears like a piece of chunky jewelry on her wrist, while the white dial keeps it elegant. Elle even takes it a step further and likes to accessorize her Daytona with additional bracelets, beads, and leather straps. Plus, the Daytona’s water resistance and robustness can keep up with Elle’s very active lifestyle. Another Rolex Daytona in Elle Macpherson’s collection is again a full yellow gold version, but this time with a champagne dial and black registers. This particular Rolex Daytona is even sportier than her white dial version thanks to the contrasting colors of the dial and subdials, coupled with the red accents. And as illustrated by Elle, the Daytona is perfectly paired with a bikini or an evening gown. An even bigger Rolex timepiece that is now part of Elle Macpherson’s watch collection is a yellow gold Sky-Dweller. 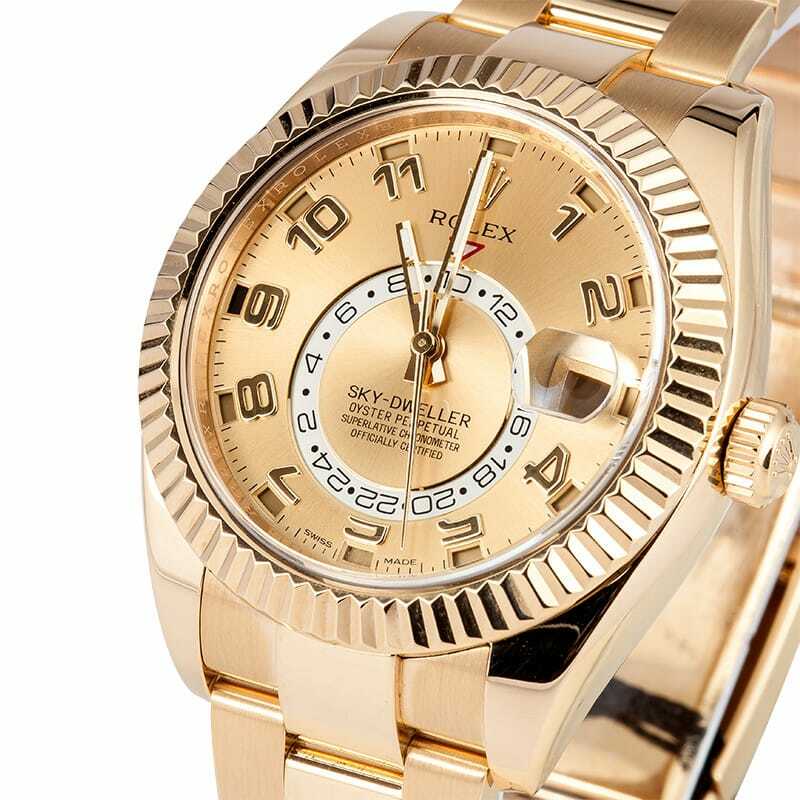 The newest collection in Rolex’s lineup, the Sky-Dweller is also one of the brand’s most complicated, offering features such as an annual calendar and dual time zones. This luxury statement watch includes a full gold fluted bezel that is not only placed there for good looks, but also serves to set the watch’s functions by controlling the mechanical Caliber 9001 movement within. The Sky-Dweller is a great watch which is only available in 18k gold, with white, yellow, and rose gold being the options. But Elle’s favorite gold for her Rolex watches is yellow— that’s probably because it looks so great on her perpetually tanned skin. An absolute stunner whose career was built upon exquisitely modeling the very best in high fashion, Elle shows us how a woman can beautifully wear a man’s Rolex watch too.